Note the height of the kindling pile compared to yesterday. Yesterday I went out and drove the Kershaw Camp 10 through some seasoned Ash from my wood pile. While I think the limits of each of the tools in this testing session are somewhat obvious, it's nice to use them all at the same time, to do the same tasks, in the same media. This is a splitting test for the sake of splitting for the most part, with no real-world objective in mind. However, while I worked with each of them, I began to think of the original question in a different way. Rather than, can these smaller tools do bigger tool jobs, it's the reverse; can the bigger tools do the small tool jobs? We know that even the biggest knife isn't going to split like an axe. And of course, inevitably, you have to ask yourself just exactly what kind of work you expect your tools to do. 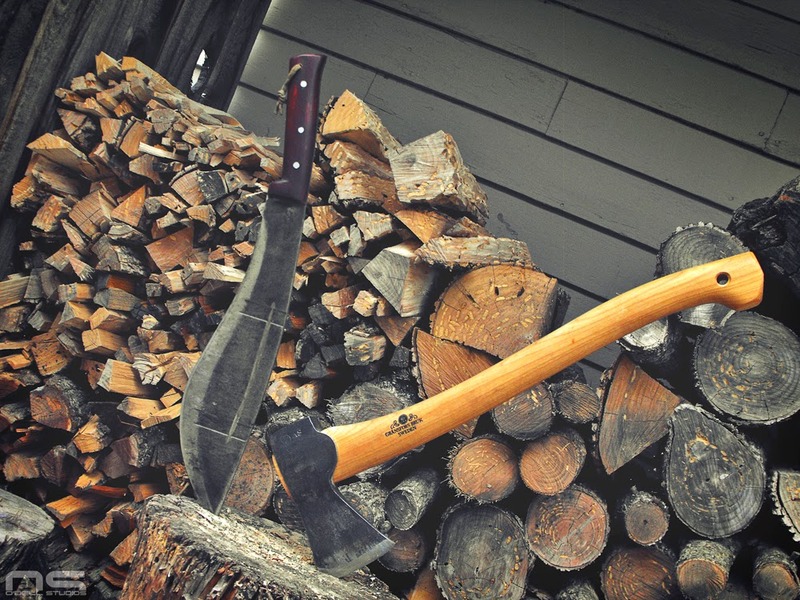 While the axe might be capable of heavy splitting, will you actually need that capability in your outdoor activities? And if we're interested in value per ounce, then what good is the extra power of an axe if you don't really have any use for it? So, as I crossed the line from large knife into small axe, the equation flipped simultaneously. There might be an interesting reason for this. 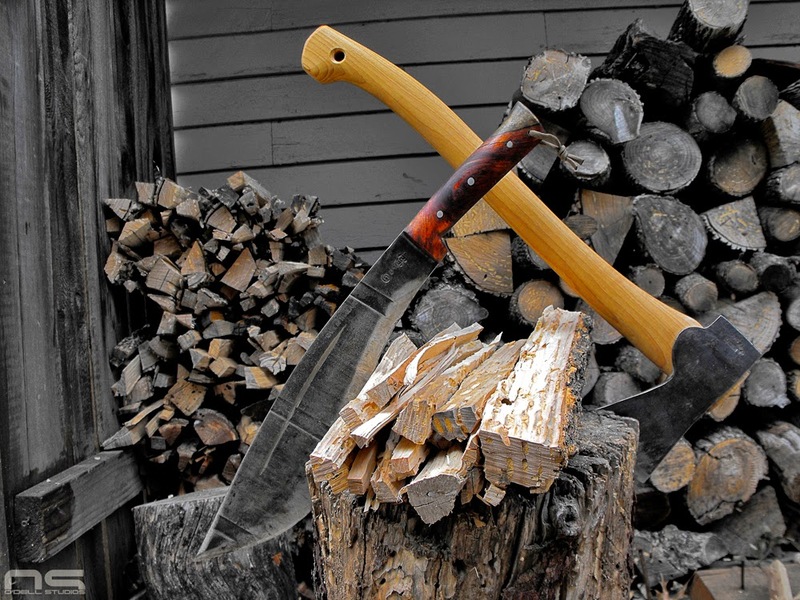 Many of you know that the Gransfors Bruk Small Forest Axe is one of the quintessential wilderness tools for a number of reasons. This being a splitting exercise, one of those reasons became apparent very quickly. It splits well beyond its size. A single, one-handed blow nearly did the job. First, let's quickly check out the Aranyik Trading Company E-nep K-1. 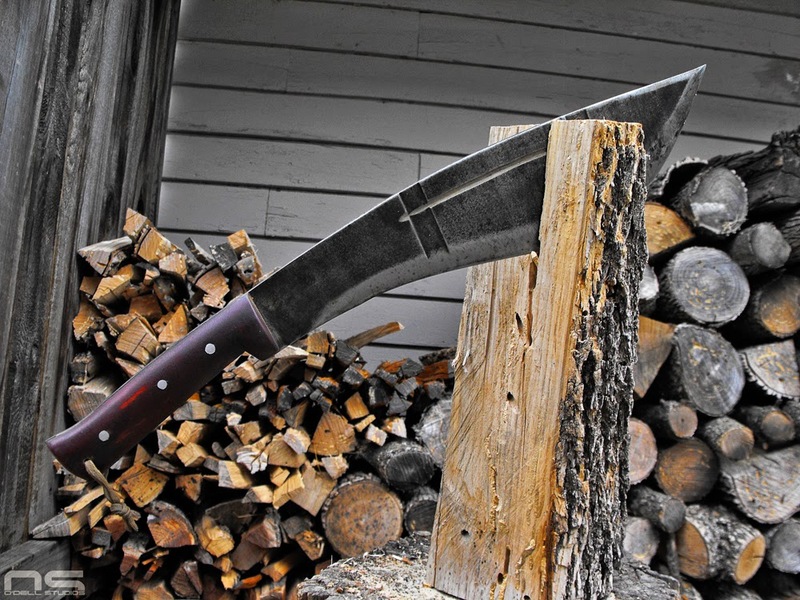 It brings eight more ounces to the table along with three extra inches, making it 1lb 10oz with a 13 inch blade of slightly thinner stock that tapers toward the tip. Every one of those extra ounces is found in the deep belly where all the work is done. As big knives go, it is a solid rung above the Camp 10. The weight is found substantially further forward and sweeping curves give the user lots of access to effective wrist action. Watch any native person using a tool like the E-nep and you will find that it's all about letting the belly drop with effortless and accurate wrist hinging motion. The people still using these sorts of knives process virtually everything with them, from food to firewood then turn around and use them to make other tools and build their homes. Splitting large chunks of hardwood really doesn't factor into their design and doing so is an injustice to the genius simplicity of the E-nep and knives like it. In an attempt to bring my splitting tool continuum into reality I switched to mostly arm-sized sticks, something a person is likely to encounter in the wilderness and select for the camp fire. I am pushing the capabilities of these tools but choosing the right tool may not be as important as making intelligent wood choices. The E-nep, and in fact the Camp 10 as well, are good workers here. The E-nep brings with it some heft and a heavy belly, tempting the user to deliver mighty one handed blows. Without any sort of real guard the user has a number of hand placement options which are very important to the versatility of the E-nep, including a forward pinch grip. Batonning quickly reduced the large chunk above, into this. 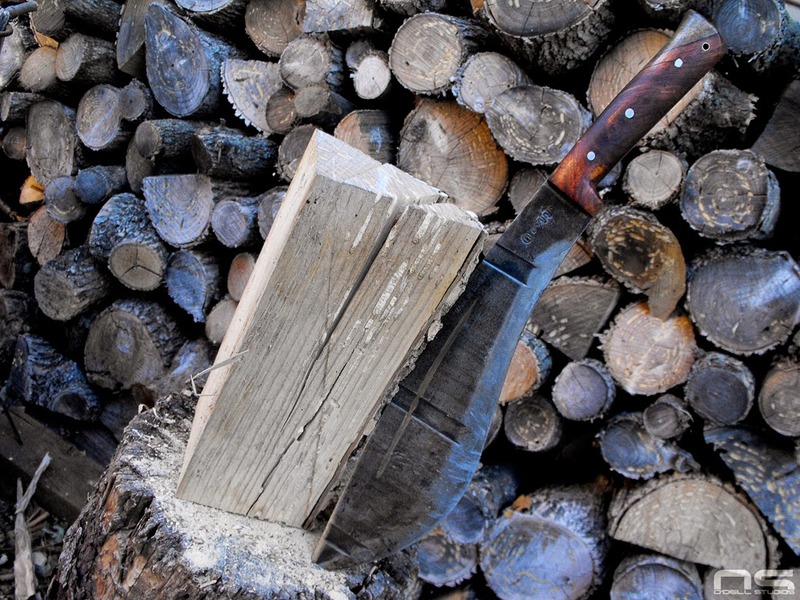 My preferred technique for splitting small stuff, and the most effortless, is to hold the wood in one hand, place the blade where the split is to occur, then tap through, moving the wood and blade together. Often I give the wood a thump with the blade just to get things going. Once started, I remove my hand and simply tap the wood and blade as one until the job is done. 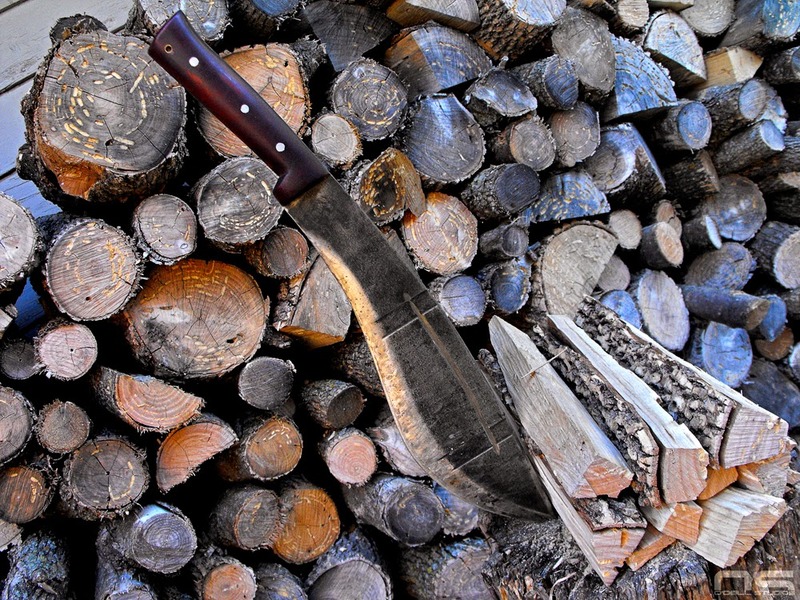 The axe is used in exactly the same fashion when dealing with kindling and small fuel pieces, so there is no reason to treat the knife differently. In this situation, big knives work nicely and batonning becomes a convenient option, rather than a necessity to getting the job done. I switched to more realistic sized chunks and reduced them from large on the right, to kindling on the left. Compare the the height of my kindling pile in the background of this image to the one at the top when today's session was done. Gnarly wood yields to the mighty E-nep! I think the handle of the E-nep is just a bit small in diameter and with the exposed tang, it feels like more shock from batonning is transferred to the user. It came with a relatively steep convex grind and strictly speaking, there is no defined primary bevel on this blade. Or maybe it is more appropriate to say that it has a convex zero grind - it has only one bevel. I believe that the flat primary bevel on the Camp 10 lends itself to wedging and the over-molded rubber handle backs it up to reduce vibrations. On the other hand, the E-nep bites so hard and cuts so well that the opposite is true when it's delivered single-handed. It's not tiresome, aside from its weight, to swing like a machete.